More than half of babies in the U.S. are sleeping in an environment that ups their risk of SIDS, according to a new study. Is your baby safe while she sleeps? More than half of babies aren't, according to a new study. 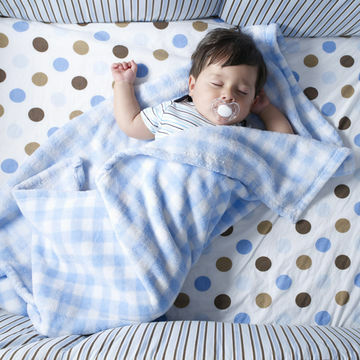 A whopping 55 percent of U.S. infants still sleep with unsafe bedding (think: blankets or pillows in the crib), according to a new study in Pediatrics. While you may count on a pillow and warm blanket for a comfy night's sleep, these items can be deadly when placed in your baby's crib as they increase the risk of sudden infant death syndrome (SIDS) and accidental suffocation. Although infant sleeping practices have gotten safer over the last twenty years—86 percent of babies slept with bedding in 1993 to 1995, compared with 55 percent in 2008 to 2010—study authors found that the decline has slowed since 2000, and hazardous sleeping areas are still a widespread practice, despite doctor recommendations. The group most likely to use infant bedding? Young moms. 2. Let your infant have her own sleeping space (a crib, bassinet, or co-sleeper) on a firm mattress—ideally in the same room where you sleep. Never sleep on a sofa with your baby. 3. Always place Baby on her back to sleep and never use a sleep positioner.